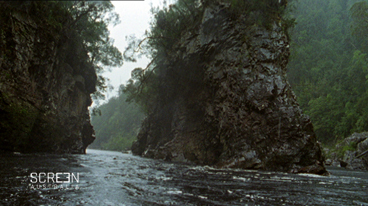 Video clip synopsis – Peter Dombrovskis' iconic photograph of Rock Island Bend became the image that galvanised public opinion and inspired the national campaign to save the Franklin River. Broadband MP4 franklin_bb.mp4 (15.5MB), suitable for iPods and computer downloads. Saving the Franklin is an excerpt from the documentary Wildness produced in 2002. Olegas Truchanas and Peter Dombrovskis were perhaps Australia’s greatest wilderness photographers. Their work became synonymous with campaigns to protect Tasmania’s natural heritage. They shared many things, including a bond that was more like that of father and son. Both came from Baltic Europe and migrated to Tasmania, where their passion for nature became a crusade to save an environment under threat. Both died in the wilderness, doing what they loved, and left a legacy in extraordinary images. A Film Australia National Interest Program in association with Big and Little Films. Developed with the assistance of the Australian Film Commission. Produced with the assistance of Film Victoria, Screen Tasmania and the Australian Broadcasting Corporation. What have been some important political developments in post-war Australian history? How have significant individuals and groups exercised their democratic rights in the post-war period? From the 1950s to the 1980s Olegas Truchanas and Peter Dombrovskis photographed Tasmania’s southwest wilderness to inform and educate Tasmanians, and eventually Australians, about the potential destructiveness of the Hydro Electricity Commission’s plans for Lake Pedder and the Gordon and Franklin Rivers. One of their photographs of the Rock Island Bend in the Franklin became the iconic image that galvanised public opinion and inspired a national campaign at both public and political level that eventually saved the Franklin River from ‘progress’. Their philosophy was simple – if people could see the beauty of the wilderness then they would be moved to save it from destruction. Note details of the 1982 plans for the Franklin and Gordon Rivers. Note how Peter Dombrovskis reacted. Explain his actions. Note what was already happening in the Franklin River. Note why this protest was better organised than before. Note the tactics used in this protest. Note the stance and reactions of the politicians involved: Doug Lowe, Bob Brown and Bob Hawke. Note how the photos of the wilderness were used in this campaign. How successful was the protest against the flooding of Lake Pedder? When did the ‘Green’ movement begin to develop as a political influence? Write a report on the campaign to save the Franklin River. Assess the role played by popular protest in the success of the Franklin River protest. Explain Bob Brown’s part in the Franklin River protest.